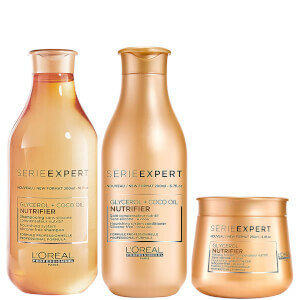 Reveal healthier-looking hair with the L'Oréal Professionnel Serie Expert Nutrifier Shampoo and Conditioner Duo. 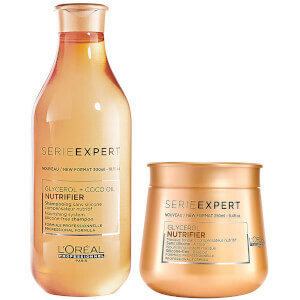 The pair of deeply nourishing formulas work in harmony to heal damage and split ends to create strong and shiny locks. Free from silicone, it works to eliminate impurities and break down dirt whilst Glycerol helps to rebalance moisture levels and form a protective seal to combat breakage and split ends. Formulated with Coconut Oil, fatty acids are replenished and hair is left feeling clean, soft and glossy from root-to-tip. 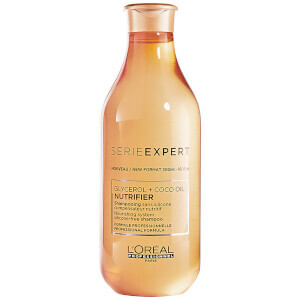 The conditioner provides an intense burst of moisture to hair without weighing it down. 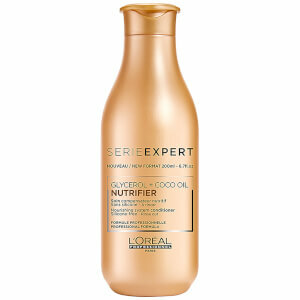 It’s enriched with a professional concentration of Glycerol, which helps to naturally seal in hydration and prevent breakage, whilst fatty acid-rich Coconut Oil works to detangle knots and smooth split ends. Hair is instantly transformed; feeling softer, more supple and boasting a radiant glossy shine. Aplique shampoo uniformemente no cabelo molhado. Massaje até fazer espuma. Enxague abundantemente. Aplique o condicionador, faça espuma e enxague. Em caso de contacto com os olhos, lave-os imediatamente. Shampoo: Aqua/Water, Cocamidopropyl Betaine, Sodium Laureth Sulfate, Sodium Chloride, Glycerin, Hexylene Glycol, Disodium Laureth Sulfosuccinate, Isopropyl Myristate, Propylene Glycol, Sodium Lauryl Sulfoacetate, Sodium Benzoate, Polyquaternium-6, Peg-55 Propylene Glycol Oleate, Peg-60 Hydrogenated Castor Oil, Benzyl Salicylate, Octyldodecanol, Benzyl Alcohol, Benzoic Acid, Limonene, Linalool, Cocos Nucifera Oil / Coconut Oil, Sodium Hydroxide, Citric Acid, Parfum / Fragrance. C207750/1. Conditioner: Aqua/Water, Cetearyl Alcohol, Behentrimonium Chloride, Glycine Soja Oil/Soybean Oil, Cetyl Esters, Isopropyl Alcohol, Glycerin, Phenoxyethanol, Benzyl Salicylate, Bht, Benzyl Alcohol, Limonene, Linalool, Chlorhexidine Dihydrochloride, Citric Acid, Cocos Nucifera Oil/Coconut Oil, Parfum/Fragrance. C187215/1.